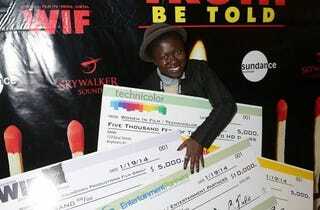 Filmmaker Frances Bodomo, seen above achieving my life long dream of holding an armful of giant checks, won four grants at the Sundance Film Festival. The grants are to go towards making a full length version of her 13 minute black and white alt-history Sci Fi film, Afronauts. Afronauts tells the alternative history of the 1960s Space Race. It's the night of July 16th, 1969 and, as America prepares to send Apollo 11 to the moon, a group of exiles in the Zambian desert are rushing to launch their rocket first. There's only one problem: their spacegirl, Matha, is five months pregnant. Afronauts follows characters that have not been able to find a home on earth and are therefore attracted to the promise of the space race.